B U B B L E G A R M: What I do best.. I don't understand people who don't like to shop either, I mean , it makes me happy everytime I do it!! 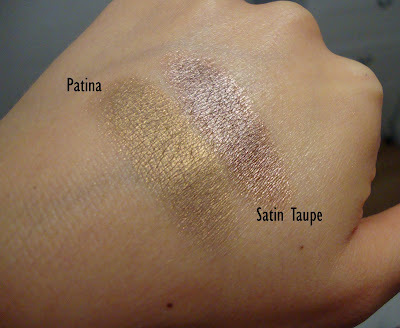 We talked about this before on Twitter but anyway, Patina looks even more beautiful in those swatches than ever before! I love the bag, elegant enough but can be casual depending on the outfit! those wedges are stunning! Need to get them for sure. I have satin taupe but it does not get much love from me. Patina would be more of my colour. love the boots and the bag is a great buy! i love when fake leather feels like real leather. it's hard to find, but worth it, i think. also, patina looks gorgeous! it's definitely on my list of mac eyeshadows to get :). love the flats - i want satin taupe also! Loving the eyeshadows - think these two are gorgeous autumn shades! Same here need a new bag too! Something comfy and gasp.. bigger. Gorgeous swatches! I'm totally excites about Autumn, it's my favourite season. Winter's a little too wet and I don't think Summer clothes are particularly elegant or glamorous. During Autumn I can fill my heart with beautiful coats and scarves and boots! I hadn't really thought about Patina before but think I'll have to take a closer look next time i'm at MAC! can a a4 notebook and folder fit in it? Oh, what i great pair of shoe boot wedges that you've found! I've also heard great things about the MAC Patina eye shadow. Nice buys! and yes I also don't get the whole "I hate shopping" it's plain nonsense! I love updating on a budget. Your purse is beautiful. I can't wait for fall too. I love that bag! What a gorgeous shade, it's dark green, right? :) Loves it! And, I have to say, Patina is my FAVORITE shadow of all time! I literally use it every day, just by itself. Love it paired with satin taupe in the crease, too (if I'm feeling like putting the effort into wearing 2 shadows, ha). 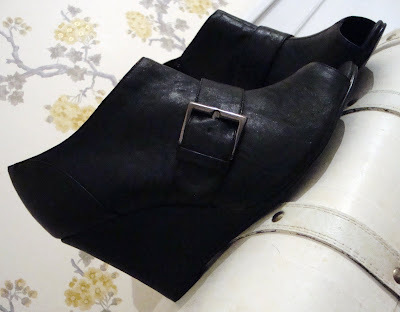 Oh and I adore those wedges, I purchase some similar but theyre a clog with studded detail on them. The bag is georgous...I am going to pop into my local TOPSHOP this weekend! Great buy esp at that price! Where did u buy the flats from? Women don't have enough bags! Patina e/s looks gorgeous.We're waiting for the make up look with it. I love your new stuff! FANTASTIC POST!I LIKE SO MUCH THIS BLOG!!! fabulous finds!! patina looks stunning!! Patina was next on my list, but after seeing cork on your blog, I've decided to get that one first, it seems to be a very versatile shade. I love Patina. Your bag is gorgeous. Love the bag! I seriously don't understand people who don't like shopping either...I mean, what is wrong with them?!?! When you find something nice...Such a good feeling, esp when it's on sale haha! @ellamarie84 Yes it's dark geen :)and I see Patina becoming my favourite eyeshadow too! @Anna Saccone, Patina would look amazing on you! @Asiya Cork is my everyday crease colour, I use it all the time. Shopping for things that work though, I love. eg books, makeup, toiletries, stationery, etc. I think I'm officially the only makeup addict left on the planet who does not own Satin Taupe or Patina! They both look like they're right up my alley, but I think I prefer Patina a little bit more. Love those wedges, by the way! Great picks! I love the bag and the boots! gorgeous buys! and i love how you storage your makeup, simple and pretty! Those flats are so cute. Patina is one of my must-haves. I can't live without it!! That, along with Arena and Texture...have you tried those? @Aslhey & @Galenx - I know how you feel, but once you know your body shape and what suits you, shopping becomes 10X easier. I love shopping for accessories and makeup as you know they will "fit", books is another addiction! + @Galenx maybe you could try personalising your clothes? @Kajal Couture - I don't have either of those but texture is on my list. I love Satin Taupe and I definitely want to try Patina...I just love MAC eyeshadows! I can't understand girls who wouldn't love shopping...I just makes you happy..I always work over hours so that I can shop even more! LOL! Anyways I really love your blog, you're an inspiration for a beginner like me! Just started following you. I love your blog! Must get Patina, must get Patina....(brainwashing myself, haha)!! !